Recently in his blog*, Blake Andrews illustrated how two photographers sometimes take very similar images. He has visited this theme before, but the current example offers a twist to the argument that the later photograph is an (conscious or subconscious) imitation. Each of his primary examples is a Vivian Maier photograph, and while all but one do predate the second example, Ms. Maier’s hoarding of her work suggests that the other photographers could not have been influenced by her images. One presumption a reader could make is that this is pure coincidence-there are zillions of subjects, but sooner or later, two shooters will “previsualize” the same image and both will produce a similar photo. The human brain is wired to see patterns, and the creative mind is just putting a rectangle around those patterns. Some of us have a good eye, some of us have a trained eye, but the end result is the same-seeing something interesting, and following through on opportunity. It is possible the coincidence is just a coincidence, and the recognition is in the eye of the viewer. 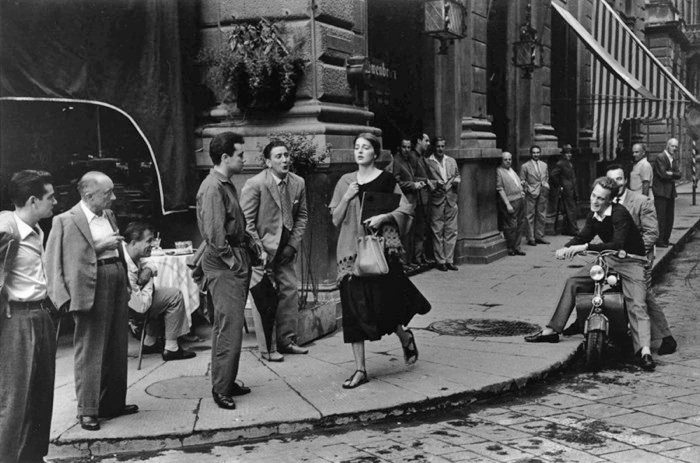 Awhile back, there was a blog discussion about “American Girl in Italy”, the iconic Ruth Orkin photograph. Some blog commenters thought it was staged, several have recreated it (with variants) , and there was plenty of discussion about the girl in the photo, men in general, and Italian men in particular. My Father was Italian (Eyetalian) and my wife has an affection for all things from Italy (shoes and food tie for first place), so this photo has always been a favorite in our household. A poster of it has hung in our dining room for more than 20 years. It was easy enough to find the girl, her identity was no secret. In this interview**, she comments on the shoot (it wasn’t staged, but it wasn’t entirely candid either), and the time she spent with Ms. Orkin. It seems they were two young American women who were not afraid to explore a different culture. I did no other research, but Ninalee Craig, the “Girl”, implies that the two enjoyed their time together, that the men were not disrespectful. A couple of years ago our daughter went to Italy, and stayed with a family near Naples. Apparently, the local kids like to hang out at the piazza, and one day, this version of American Girl in Italy” showed up on her Tumblr page, with the caption “Italian Boys ha ha”. Was she consciously or subconsciously imitating this photograph she grew up with? She was just an American Girl in Italy. This entry was posted in Other Stuff and tagged American Girl in Italy, Italian Boys, Italian men on April 26, 2015 by Jimmy Reina. The signmaker has me confused Are they asking me not to east any of the plants that are around the building? 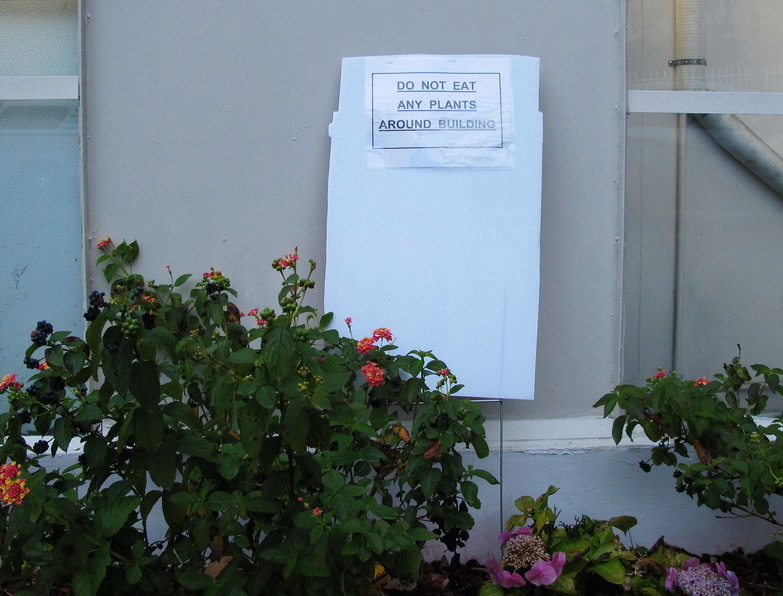 or Are they asking me not to bring my own plants near the building in order to eat them? This entry was posted in Other Stuff and tagged Sign on April 13, 2015 by Jimmy Reina. I was weaned on coffee. Seriously, I was weaned on coffee. When I was an infant (and to my Mother’s dismay), my Grandmother would mix coffee (and certainly sugar) with the milk in my bottle, and feed it to me. Grandma was a baker, so as I progressed to solid food, my morning cereal was chunks of fresh bread in a large bowl of this same “latte” mix. There has not been a day of my life that hasn’t started without fresh coffee and for almost 40 years, those days have started with grinding my beans. 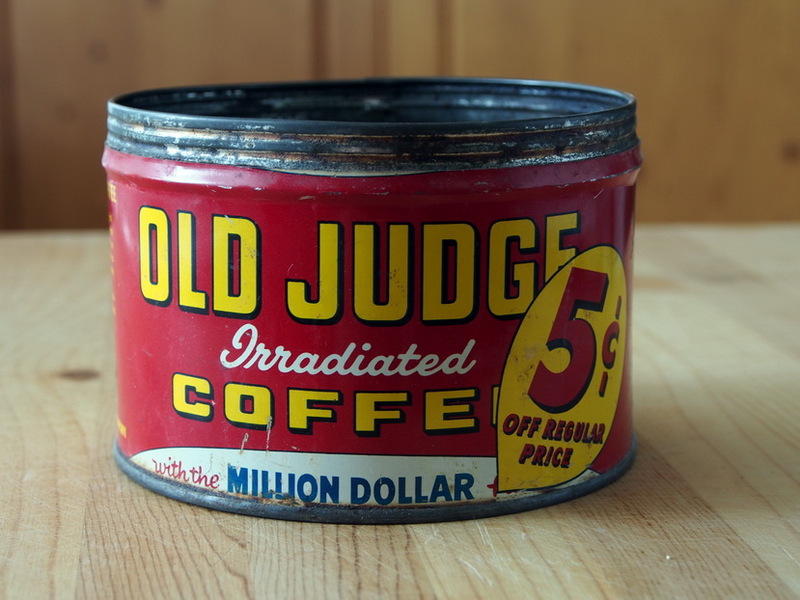 For 20 of those years, I have devotedly bought those beans from the same roaster. I’m in Berkeley, California, where coffee is taken (sometimes too) seriously, and there is no shortage of roasteries. My office once sold a house to someone who stipulated they be located within walking distance of The French Hotel Cafe’, where I buy my beans. Sometimes, when I want a midday cup, I will drive across town in order to enjoy their coffee, it’s that good. Now I’m in panic mode! The Cafe’ will no longer sell them by the individual bag. I am a bit of a coffee snob, not for brand names (and we have plenty of them in Berkeley), but for freshness, quality, blend and roast that satisfies my taste buds. It has to be fresh, and it has to have soul. If necessary, I will go to San Francisco to buy my beans, but it’s a schlep, and it is a trip that will have to be planned several days in advance. A recent off topic discussion on a photo blog that I read suggested mail order bean purchasing, but that is even less my style-with certain things, particularly food, I’m an instant gratification guy. I wouldn’t have the patience for trial and error tastings. I feel like a junkie, who knows where the “good stuff” is but it is inaccessible. My current plan is to call the roaster, and start begging. I went to the roastery, and begged them to sell me beans. Although they are not set up for retail walk in in customers, they were very accommodating-a very nice office manager went back in the warehouse and personally had a bag of beans prepared for me. While I was waiting, I joked with her colleague that I must have sounded like a junkie, pleading that I had to have “the good stuff, only the good stuff will do”. This entry was posted in Other Stuff and tagged caffe, coffee on April 1, 2015 by Jimmy Reina.